We know that bees are key to the survival of the human race, for without them the cross pollination that is vital to the generation of plant life would not be possible. In a more ecologically conscious world, it seems fitting that Suprajit Raikar, who has a Master of Computer Applications degree, found his calling in contributing to the conservation of the environment and helping his fellow man by becoming an apiarist. Suprajit, the founder of the DMD Youth Adventure Club, an NGO that was conceptualised to use adventure activities towards the betterment of the lives of the underprivileged, is also the innovative mind behind Padekar.com. The Padekar.com website was temporarily shut down but now functions, supplying an online form that puts customers in direct contact with coconut pluckers (padekars). After returning to the IT industry for four months, in September 2016 Suprajit left to start beekeeping and establish his company M/S Raika & Co, which has for sale organic honey, honey combs, and black rice. The idea for beekeeping germinated from the excursions of DMD Youth Adventure Club into the Western Ghats. It dawned on Suprajit that there were acres of flora that remained unutilised and beekeeping could be one way of enabling the tribal people in the region to economically empower themselves. 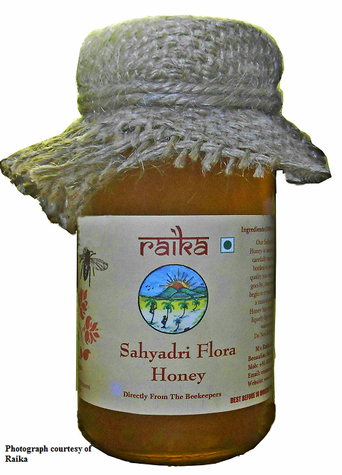 The tribal people, who are mostly farmers, would produce the honey which would then be marketed by Raika. They decided to begin with training the tribal people in the Netravali area. Suprajit has done a short term basic course in beekeeping from Krishi Vigyan Kendra in Old Goa, and a more in depth course from the Central Bee Research and Training Institute, Khadi and Village Industries Commission, Pune. In Pune he learnt about establishing and maintaining a bee colony, viable locations, safety measures required because fatalities can occur in the case of an attack by a swarm of bees, how to use various types of equipment, etc. Apis cerana indica, or the Indian hive bee, is the best option for the flora and topography of the Western Ghats. Apis dorsata (Rock bee) give a higher yield of honey as compared to the Indian hive bee, but they are highly aggressive in nature. They usually chose to build their hives on tall buildings or trees and prefer open spaces. The milder Indian hive bee is satisfied with narrow spaces like a box to build a hive. Apis mellifera (European or Italian bee), which is the highest producer of honey of the three, is not an indigenous bee. Although it may be highly desirable to use these bees to create a colony, the climate and the landscape acts against their survival. The Italian bee prefers a flat topography with a cooler climate and has a better chance of being productive in places like the Punjab and Haryana. In 2013 a project in Goa involving the Italian bee met a huge loss with the collapse of the entire colony. 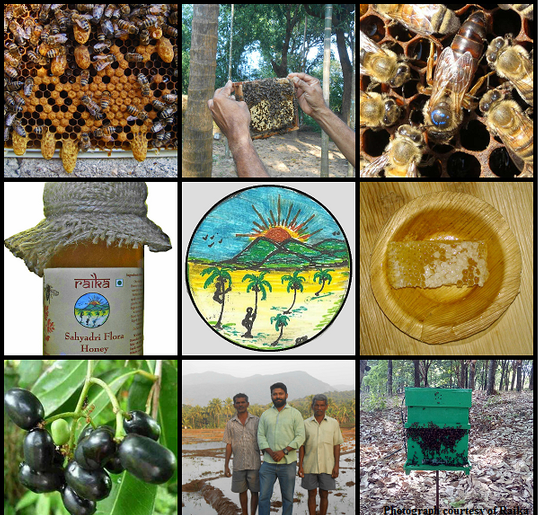 ‘The locals from the tribal area call them sathpode or sathode,’says Suprajit referring to the Indian hive bee. He says, ‘These people are very familiar with handling the bees. I thought why not produce honey using these bees.’ The apiary he has set up next to his own house poses no threat to the people around because these bees attack only if provoked and not necessarily in a swarm. They thrive on the pollen of the coconut trees and are advantageous to the growth of coconuts. The taste of the honey largely depends on the flora around the hives, as in the case of the bee boxes in Netravali where the honey has a jamun flavour because of the proximity of the boxes to around 60-70 jamun trees. Suparjit says, ‘The local bees are good pollinators even though they collect less honey compared to apis dorsata or apis mellifera. Apis dorsata and apis mellifera produce a huge quantity of honey like 30 kg or so in a season, while the local bees produce just 10 to 15 kg.’ The season is, of course, in tandem with the flowering period from November to May. As first-rate pollinators, these bees also contribute effectively to the farming activities of the tribal people. Raika honey is available through Amazon.in and wholesale at Benaulim. In November 2016, DMD Youth Adventure Club kick-started their project Bees for Sustainable Development to financially benefit the tribal areas, and by December at least five bee boxes had been given to them. The project aims to dispense 100 bee boxes with 50 in Sanguem, and 25 each in Quepem and Canacona. Suprajit has approached NABARD (National Bank for Agriculture and Rural Development) and secured its assurance of aid. This has been taken as a pilot project which will be extended to North Goa eventually. Though the tribal people do extract honey, they have no means of marketing it extensively. ‘I thought why not market that honey and also teach them the scientific method of beekeeping. Usually they just fire up the entire place, or the tree, and in the process they kill the bees. But here, it’s like a nonviolent movement, we use a bee smoker to avoid killing the bees,’ says Suprajit. The tribal people get a fair price for the much in demand organic honey and honey combs that seem to be a delicacy dessert in five star restaurants. Five percent of the sales is used to sponsor equipment for the farmers. Even the residual beeswax has its advantages. It can be mixed with coconut oil and pepper to act as a natural moisturiser. The company is in the process of getting an FDA approval to market it and thus add to the income source of the tribal people. Beeswax will also be utilised to manufacture candles. Raika is also selling black rice grown by a farmer in Netravali. The seeds for this black rice were purchased from Sikkim by the Agriculture Department. It is far more nutritious than normal rice and has the fragrance of basmati rice. Having purchased 70 kg from the farmer, the entire stock was sold out in one to two months because of the high demand. The company plans to extend its sales to untapped domestic and international markets with its organic, fair trade honey and products made from honey, honey combs, beeswax and bee venom. 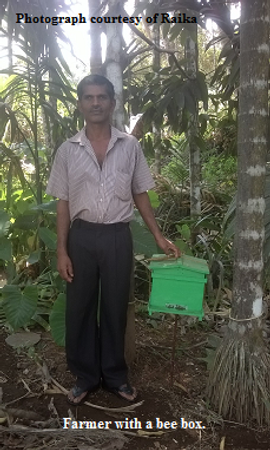 The Bees for Sustainable Development project aspires to alleviate the poverty of these tribal farmers by increasing their yearly income from 20,000-30,000 rupees to at least 40,000-50,000 rupees and promote beekeeping with apis cerana indica, thus benefiting man as well as the environment.